Tom Greinier has been hauling fish for Juneau's salmon hatchery, Douglas Island Pink And Chum (DIPAC), for over 20 years. 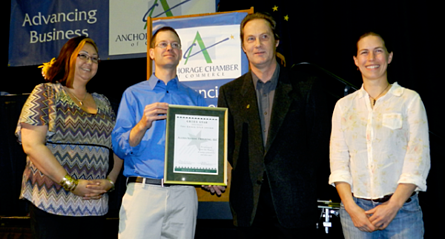 In fact, DIPAC has followed Tom during his trucking career even before he started working for Alaska Marine Trucking. "He's the reason we haul fish for them at all," says fellow Driver Brian Weokoluk. "They specifically ask for him year after year." Not only have Tom's skills behind the wheel led to a long-lasting customer relationship, his commitment to working around DIPAC's schedule has fed Juneau's waters with predictable salmon spawn while supporting the fishing community. 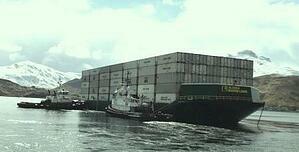 Alaska Marine Trucking Driver Jim Cartmill is a member of the DIPAC Board of Directors. "Trucking live fish from one point to another is crucial in the hatchery's success," he says. "They're raised at Macaulay until they're about 3 inches long, and then hauled off to an ocean pen where they mature and are released into open water. DIPAC is a huge support to both our local and intra-state communities." According to Brian, the reason DIPAC trusts only a select few to truck live fish is all in the gear shifting during transport. The drive must be as smooth as possible for the least amount of disruption to the fish. If the gear changing rocks the holding tanks too much during the drive, it can cause air bubbles in the tankers that may stress or even kill the small fish fry. Fortunately, that's not a worry with professionals like Tom in the driver's seat. This spring he took some time to talk another of Alaska Marine Trucking's experienced drivers through the process for their first run to the Thane Road site with a DIPAC employee. Alaska Marine Trucking, Alaska Marine Lines, Lynden Transport and Lynden Air Cargo all played a role in the multi-modal move of an amphibious unit from Southeast Alaska to Barrow. Working together, the Lynden team moved the prototype machine and its equipment from Ketchikan to Haines via ferry, Haines to Anchorage via truck and Anchorage to Barrow, the northernmost city in the U.S., via air. Customer Service Representative Lisa Adams coordinated the booking and logistics with the support of Alaska Marine Trucking employees Kathleen Gamble, George Mitchell and Keith Nelson who handled tasks including loading the unit on a flat in Ketchikan. “Bill Gallaway scheduled loading and took measurements with me and Kathleen in Juneau gave pricing and made driving arrangements to get the unit to Anchorage,” Lisa says. The machine is a prototype built by Randy Johnson and his son Tyler of Tyler Rental in Ketchikan. Organizations have expressed interest in using the unit for search and rescue and oil spill response among other things. 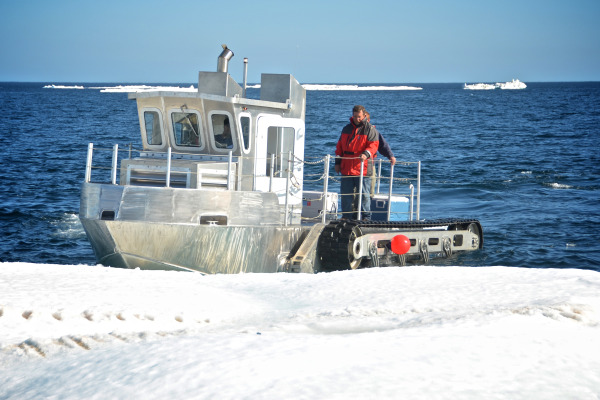 “This move was extremely critical due to the requirements of our contract to demonstrate the unit to the U.S. Coast Guard in Barrow,” Randy explains. “We were very pleased with the support provided by the Lynden team". The logistical plan including loading the machine at the manufacturing facility in Ketchikan and transporting it to Alaska Marine Lines for loading onto a 40-foot flat. Transport out of Ketchikan was challenging. The amphibious craft was loaded onto a ferry. A Lynden driver met the ferry in Haines to haul the unusual machine on the next leg to Anchorage for loading on a Lynden Air Cargo Hercules. Once in Anchorage, the machine was transloaded again onto a special trailer that Lynden uses for loading the Hercules. It was a tight fit inside the Herc as Lynden’s maximum height for cargo is 8 feet, 9 inches high and 9 feet wide inside the plane. The flat was slid into the plane on custom skids placed on each side. Tyler rode as a courier on the Herc. “Once we arrived in Barrow around midnight, we placed our craft on the tarmac and began assembly the day after,” he says. After its journey north, the ‘Amphib’ was back in Anchorage for a few weeks where Tyler was offering demonstrations. 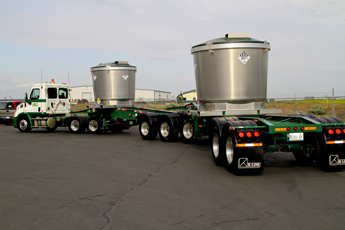 Last year, four Lynden companies teamed up on a project to transport lead and zinc ore concentrate from the Yukon Territory to Washington and then deliver it to its final destination in Trail, B.C. Alaska Marine Lines, Canadian Lynden Transport, LTI, Inc. and Alaska Marine Trucking began transporting two-ton bags in November 2010 then, in March 2011, switched to specially designed ore containers. Canadian Lynden Transport’s Whitehorse operation trucks the ore concentrate 400 miles from the Bellekeno Mine site in the Yukon Territory to Skagway, AK, where it is loaded onto Alaska Marine Lines barges by Alaska Marine Trucking. Once the barges reach Seattle, LTI Inc.’s Moses Lake operation picks up the huge ore pots and delivers them to a smelter in Trail, B.C. The ore is carried in 16-ton pots moved three at a time on a B-train chassis from the Yukon to Alaska at a total weight of 170,000 pounds. In Washington and British Columbia they are carried two at a time for a total weight of 105,000 pounds (see photo). The new contract is keeping the LTI, Inc. Moses Lake crew busy. "This has been an interesting project for us,” says Regional Manager Vance Jansen. “It's a good example of the efficiencies that come from multiple Lynden companies working together." Lynden International also plays a role by filing customs entries.